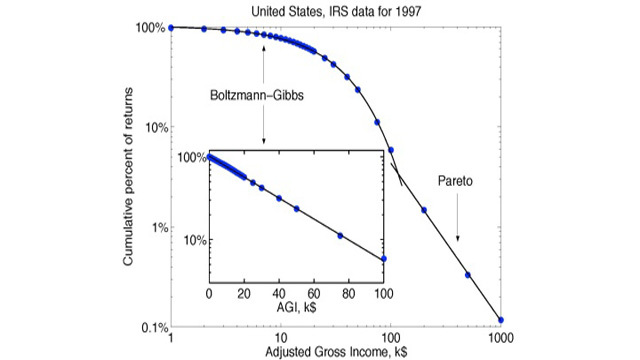 Fraction of tax returns above various adjusted gross incomes; the two curves fitting the data correspond to an exponential-type behavior (Boltzmann-Gibbs) and power-law behavior (Pareto). Courtesy Victor Yakovenko. "A mathematical analysis of the empirical data clearly demonstrates the two-class structure of a society," Yakovenko says. The lower-97% curve is an example of exponential behavior, while the upper-3% curve is an example of a power-law behavior. The power-law curve is conspicuously different from the exponential curve in having a long tail, as shown in Figure 1. Courtesy Victor Yakovenko. "Money, it’s a gas," says the sixties rock group Pink Floyd in their song “Money.” Indeed, physics professor Victor Yakovenko is an expert in statistical physics and studies how the flow of money and the distribution of incomes in American society resemble the flow of energy between molecules in a gas. In his lectures to be delivered on April 19 at New York University and April 20 at the New School for Social Research, Yakovenko will bring his physics-of-incomes study up to date, including a report on the correlation between levels of income inequality and the appearance of financial downturns, such as the dot-com bubble of 2000 and the more recent housing bubble of 2008. That the rich really are different is a common opinion. It turns out that the rich even have their own physics. Yakovenko, who is a professor at the University of Maryland and also a fellow of the Joint Quantum Institute*, produces a plot of the cumulative percentage of the population versus income. The graph shows that the actual income distribution (the data coming from the IRS) for the poorer 97% of reported returns follows a type of curve---the Boltzmann-Gibbs curve---that applies to the energy distribution of molecules in a gas. The curve is named for 19th century physicists Ludwig Boltzmann and J. Williard Gibbs, pioneers in statistical physics. By contrast, the upper 3 percent or so of incomes, starting at a tax-return level of about $140,000, lie along a different curve, one named for Vilfredo Pareto, an economist who studied income distributions in the 19th century. This distinction in income curves is generally attributed to the fact that the most affluent segment of society makes more of its income from investments, which are taxed at a lower rate, rather than income from labor. “A mathematical analysis of the empirical data clearly demonstrates the two-class structure of a society,” Yakovenko says. The lower-97% curve is an example of exponential behavior, while the upper-3% curve is an example of a power-law behavior. The power-law curve is conspicuously different from the exponential curve in having a long tail, as shown in Figure 1. Then, Yakovenko plots the percentage of total income lying in that tail on through the years. He finds that the periods of greatest inequality are also periods of bursting investment bubbles. 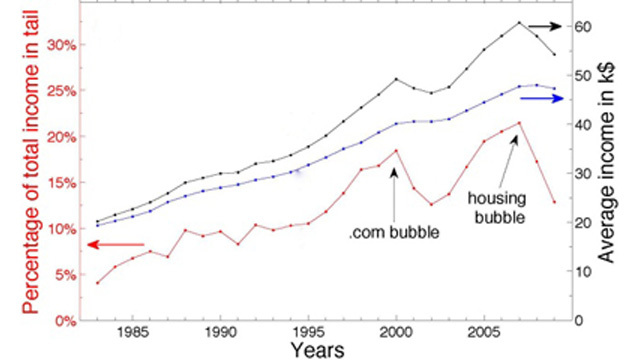 Most recently the inequality peaks lined up very closely with the housing bubble of 2008, the dot.com bubble of 2000, and the savings-and-loan crisis of the late 1980s, as shown in Figure 2. Yakovenko successfully models income distribution pretty well using basic statistical physics. In the case of a gas, molecules come to have a great inequality in energies, all through their random collisions with each other. People are not inanimate molecules and yet through their economic and social “collisions” they too come to have a very similar, and unequal, distribution of incomes. Previously the upper income bracket (the upper 3%) curve had been pretty well studied, but Yakovenko was one of the first, perhaps the first, to demonstrate that the lower bracket (the lower 97%) was described by the venerable Boltzmann-Gibbs curve developed to represent the spread of energies of molecules in a gas. Yakovenko’s pioneering study of the 97% was summarized in a review paper in the journal Review of Modern Physics in 2009 (**) written in collaboration with the distinguished economist J. Barkley Rosser, Jr. Yakovenko got started in econophysics in the year 2000, at a time when statistical mechanics wasn’t used much to study economics. He has prepared an updated study of income distributions, for his participation in a celebration (April 20-21) of the career of economist Duncan Foley at the New School for Social Research in New York. Foley was a pioneer in marrying economics and statistical mechanics. (*) The Joint Quantum Institute is operated by the University of Maryland in College Park and the National Institute of Standards and Technology in Gaithersburg, MD. Copies of Yakovenko’s 2012 report are available from the Joint Quantum Institute.